Whilst developing the software for our Arduino based Serial Graphic TFT Display a problem with transmitting too much data at once occured. When using our TFT display we expected the controlling program to send a big burst of serial data initially to set various configuration settings on the screen and to display a screenfull of data. The Arduino core code contains a nice little round robin data buffer where you can keep throwing data at it and the arduino code will read the data and process it in order. However, this data buffer is by default only 64 bytes in size. This value is hard coded in the Arduino core source code and applies to all Arduino boards, even those with a vast amount of RAM available. The 64 byte limit meant that sending a burst of data longer than 64 bytes would cause data to be truncated as the ATmega328 could not process the data sent fast enough. The solution is easy, increase the buffer size to 256 bytes. 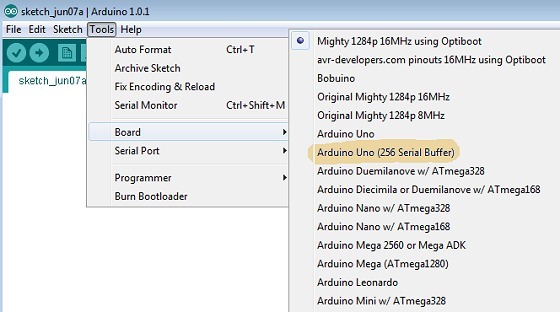 This is easy enough to implement but is a real pain because the Arduino core code which includes this setting is compiled before your actual program code is, so you cannot simply setup a #define or similar function to be able to select buffer size at compile time. We found a number of convoluted methods on the internet which claim to work, but we thought an easier solution might be of use to others who need to increase the buffer size. The method described below is the option we chose to implement, and while not exactly elegant is easy to use and understand. The solution is to create a complete copy of the arduino core code (it's really not that big and disk space is cheap), modify the buffer size in the new core code and then to create a new board which is listed in the Arduino IDE which uses this new core directory. The steps to follow are as follows..
That's all you need to do. Now when you want a larger serial buffer (for a specific board) you just choose this as the board in the Arduino IDE and compile as normal. If you want to hack any other settings in the Arduino core, this is also an excellent way to do it without modifying the original source.